The scholarship application deadline was March 15th! Have you participated in at least two years of track and field or cross country? Are you planning on continuing your education after high school? If so, you may be eligible for a Future Track Running Club Scholarship! 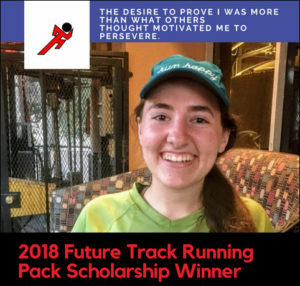 Future Track Running Club has a tradition of awarding an annual $2000 scholarship to a local high school senior who has participated in track and field and/or cross country in high school for at least two years. This is a great opportunity for students to be recognized by their peers and receive a significant monetary award for their achievements. Applicants are asked to submit a 500-word essay that addresses a question regarding the impact that their athletic experience has had on their life.